With Easter just a few days away why not add something more than candy to your kid’s basket. 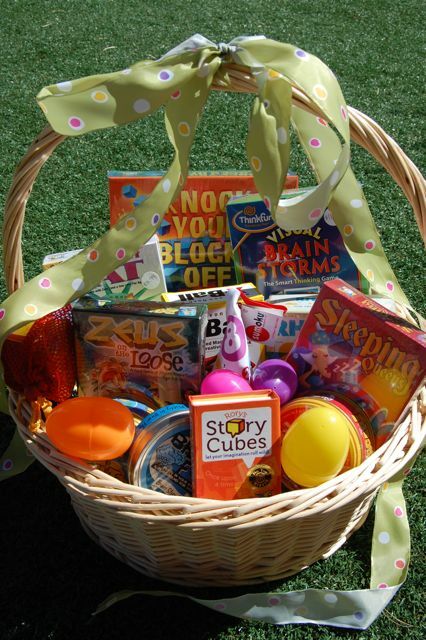 Check out some of your ideas for making your child’s Easter basket fun, creative, and unique. Toddlers are just beginning to learn about Easter and what it means to receive an Easter basket. Keep it simple with brightly colored plastic eggs. In the case of toddlers, you don’t need to fill the eggs with anything because anything small enough to fit in an egg can be considered a choking hazard. In addition to plastic eggs, you can include Easter themed soft books, building blocks and stuffed animals. If your little one is head over heels for craft projects and coloring an excellent idea is to arts and crafts themed Easter Basket full of special goodies. Crayons and coloring books are a must. Include items such as markers, finger paint and/or paint and paintbrushes. You can’t forget the construction paper in a variety of wonderful colors. From infant to teenager, books are perfect Easter-basket filler. This may be a clichéd but the truth is that books are one of the best gifts that you can ever give to children on any occasion. Books help to develop a habit of reading in children that they can pick up as a hobby. Reading helps to expand the mind and creates a sense of curiosity and thirst to find out more. For toddlers you may want to choose cloth books or board books with thick pages and bright colorful pictures. Preschool and early elementary students enjoy books about animals, other children or their favorite television characters. For older children and teens, pick the newest book in a series they enjoy or a subscription to a favorite magazine. Are you looking for something different to do with your eggs on Easter? 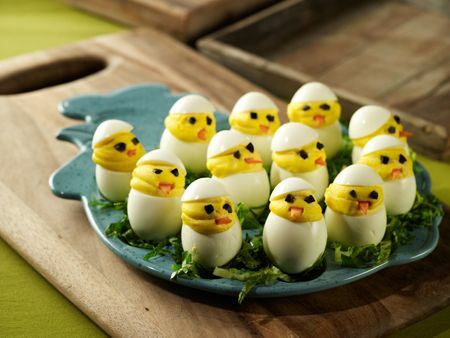 How about making them into these cute little Easter Chicks? They are rather simple to make and cheap too. To make deviled eggs start by first boiling them. The best way to make boiled eggs is to put 12 in the bottom of a 3 quart pan. Cover with water (have the water about 1 inch over the eggs). With the lid off bring the eggs to a boil once they have reached a FULL rolling boil, let them boil for 2 minutes. Turn the heat off, put the lid on and let them stand for 15 minutes. Once 15 minutes has passed take them out and put them in an ice bath cooling them, so you can then peel them. Once you have all 12 eggs peeled, cut a SMALL section off the wide end, this will create a flat surface so the eggs can stand up and not roll on the plate. Carefully remove the yolks, being careful not to tear the whites. (This will take a bit of patience.) Collect all of the yolks into a small mixing bowl and add the mayonnaise, mustard, salt, and vinegar. Mix until smooth. To make a really creamy filling, use a fork and mash the yolk up as fine as you can make it. Then mix in the mayo and a little salt (to taste) until it has a consistency of pudding. At this point, it’s still a bit gritty though. So scoop the entire mixture into a gallon-sized Ziploc and knead the baggie just as if it were dough! Spend a good 15 to 20 minutes squishing the baggie until it’s super creamy like frosting. To fill the egg white halves from the baggie, just cut the corner of the baggie and squeeze the bag, applying it to the egg halves like squeezing icing onto a cake. To make the Chicks eyes cut a small pickle length wise , into 4 thin strips. Then cut those thin strips into even smaller section to create a little eye. Do the same thing to a baby carrot, but cut the 4 thin strips into a triangle shape for the chicks beak. Place the top of the egg back on at an angle so you can see the chicks face. Add the eyes and beak and you are done.